MOHS SURGERY is an outpatient surgery/procedure performed at both the Valencia and Palmdale offices by Dr.McCray and Dr. Chow. Mohs micrographic surgery is a tissue sparing surgical procedure developed for the removal of skin cancers. It is typically utilized for skin cancers located in cosmetically sensitive areas and where functional tissue preservation is paramount. The strength of this procedure is that the tumor is mapped and the entire surgical margin is examined to confirm tumor clearance. This process results in a high cure rate and a low recurrence rate compared to other treatment modalities. Because this is a tissue sparing technique, the least amount of normal tissue is removed. 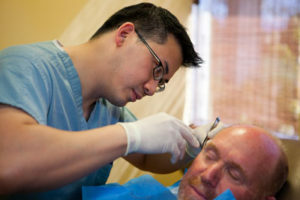 MOHS micrographic surgery is a special form of surgical technique that uses pathological evaluation to remove skin cancers that are high-risk or located on cosmetically sensitive areas. In essence, it allows Mohs Surgeons like Dr. McCray/Chow to be able to remove the skin cancer by examining the entire margin of the skin while simultaneously minimizing the amount tissue needed to be excised out. The most important part of MOHS surgery is the method of preparing the tissue for histological evaluation that allows examination of 100% of the margins of the skin cancer. The ability to produce a precise micrographic map of where the skin cancer is located and his ability to be both a surgeon as well a pathologist give him the unparalleled opportunity to have a high cure rate while providing tissue sparing ability for this type of surgery. What are the indications for MOHS Micrographic Surgery? Basal cell carcinoma and squamous cell carcinoma are examples of non-melanoma skin cancers, which are the most common types of cancers worldwide. They carry with themselves significant morbidity and occasionally mortality. There are many different methods of managing non-melanoma skin cancers, ranging from electrodesiccation & curettage (C&D), topical chemotherapy, regular surgical excision, radiation therapy, and Mohs surgery. Mohs Micrographic Surgery allows examination of 100% of the tissue margins and has the highest cure rates of all forms of skin cancer surgeries. However it is not practical to use this technique for the management of every type of skin cancer, especially those that have lower risk of recurrence or in areas where sparing of tissue is not of paramount importance. Therefore, Mohs Micrographic surgery is very commonly used for skin cancers that are on cosmetically sensitive areas of the body such as the face, the hands and the feet where there is not much tissue to spare. Also, MOHS is also indicated for skin cancers that are poorly differentiated or of higher metastatic risk. Finally, skin cancer that have perineural invasions or lesions that are greater than 2 cm in diameter or lesions that have very poorly-defined clinical borders are also candidates for Mohs Micrographic surgery. How is MOHS surgery different from routine skin cancer excision? A routine surgical excision requires that a wide margin of tissue be removed around the clinically involved skin. Because the cancer cannot be seen with the eye, a larger margin of normal skin (compared with Mohs surgery) must be excised. This tissue specimen is then sent to a pathologist or dermatopathologist to confirm tumor clearance, with the patient being notified of the results one to two weeks later. Due to the technique used to evaluate the histological margins (bread loaf technique), only a small portion of the surgical margin is evaluated (<1% compared to 100% with Mohs surgery). To compensate for this, a greater amount of tissue is excised so that there is an increased probability of overall tumor clearance. For a small percentage of cases, a re-excision may be necessary if the tumor is not cleared. This contrasts with Mohs surgery, where the patient is not discharged from the office until the tumor is cleared. The decreased certainty of tumor clearance at the time of excision generally prohibits implementation of advanced reconstruction techniques. A routine excision, however, can be an appropriate treatment when overall tissue preservation is not essential. This technique is also less expensive compared to Mohs surgery. Mohs surgery has the highest cure rate and lowest recurrence rate among all the current treatment modalities–as high as 98% to 99%. What is the history of MOHS Micrographic Surgery? MOHS surgery was pioneered by Dr. Frederick Mohs, a professor of surgery at the University of Wisconsin, who first published his surgical procedure in 1941. The technique was originally known as chemosurgery. The technique involved the use of zinc chloride paste that was pasted on the cancerous tissue for 24 hours prior to surgical removal. When the skin cancer was excised, it was sectioned into several different pieces and the areas were marked with color dyes for orientation. The color dyes allowed for detailed mapping of the tumor indicating where the skin cancer might be located within the actual tissue. Then physical pressure was applied to the tissue in order to flatten it so that all the lateral and deep margins will be present on the histological examination. Then several tissue sections were cut and then examined under microscope. If any skin cancer was observed, the exact location of the residual skin cancer was noted on the map using the dyes as orienation markers. Over the next 30 years, the tissue processing for Mohs’ surgery has evolved from the zinc chloride paste to fresh frozen technique that was later described by Tromovitch and Stegman in 1974. The new fresh frozen technique, in contrast to the zinc chloride paste technique, is very important because it does not need zinc chloride paste, which leads to necrosis of the skin. It also allows dermatologist the opportunity to completely clear the skin cancer using multiple levels all in one day. 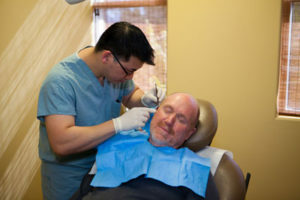 The fresh tissue technique has become the standard of care in the MOHS micrographic surgery. 6. Close the surgical defect. Mohs’ micrographic surgery requires the MOHS Micrographic surgeon to have an excellent understanding of both the cutaneous as well as the soft tissue anatomy, especially that of the face both for the excision of tumors as well as for reconstruction. One of the most important aspects of Mohs’ surgery is that the surgeon not only has to be able to excise the lesion but also serve as a pathologist to read the specimen during the surgery as well as having the capability of reconstructing the wound itself. 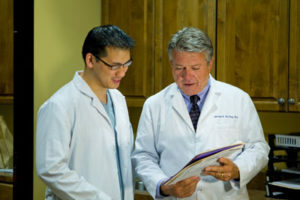 Dr.McCray and Dr. Chow have performed many successful MOHS Procedures. Are most skin cancers removed by MOHS surgery? No. The majority of Basal cell and Squamous cell skin cancers in United States are treated by non-MOHS surgery techniques. These involved electrodesiccation & curettage, topical chemotherapy, regular surgical excision permanent sections as well as radiation therapy. These techniques provide reasonable cure rates that are also cost efficient. In contrast, MOHS micrographic surgery is designated only for high risk skin cancers or for skin Basal Cell and Squamous Cell carcinomas of the face, neck, hands and feet. What are the treatment options for non-melanoma skin cancers? Depending on the cancer type and location, other treatment modalities are available. Sope options include electrosurgery, routine excision, imiquimod, radiotherpay and 5-fluorouracil cream. These options are discussed with patients at their initial consultation. What are some of the key features for MOHS micrographic surgery? 100% of the tissue margina are examined. There is a very high cure rate. This is a tissue sparing procedure. A very precise map of where the residual tumor might exist can be produced. Dermatologist is both trained in surgical excision of skin cancer as well as is trained as a pathologist to read the skin cancer during the same day and finally is trained to reconstruct the defect that has been created. There are less side effects and complications because of the tissue sparing ability of MOHS surgery. The cure rate is very high and leads to less recurrence of the skin cancer.